The Tummy Channel is back! Tummy Mountain now sends it's signal from even further away from the bright lights and big smoke than ever before. The mountain is rounder and steeper. The croaking frogs are definitely louder. And yet despite distance and obscurity, The Tummy Channel is still the Number One Broadcaster of the Love of Jumping Up and Down on the Couch! 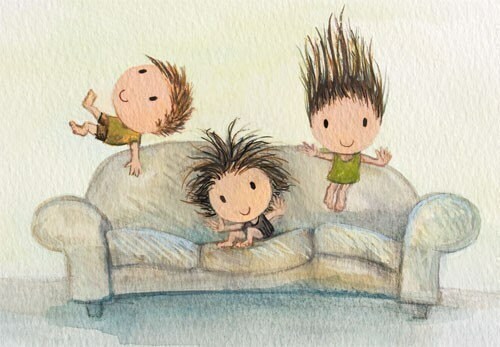 A big hello to all our followers of the extreme sport of Couch Jumping wherever they may be in this wide wide world. Yes, even as I write this post I can hear a lot of the kind of giggling and crashing noises that our premium athletes typically make when warming up for a Serious Championship Bout of Leaping on the Sofa. Yes fellow sport lovers, you can be assured that this station, the only one using State of the Art TummyVision, will bring you the latest and greatest exploits and adventures of the little ones as they occur! Sofa jumping... hm... Do you suppose it's okay to get rid of the mini trampoline then? PS. That is one of my very favorite pictures. Yep. It is time to go professional! The mini-trampoline is for the mini league. The couch is Big Time Jumping! I can scarcely wait until the children arrive to jump all over my furniture! Hi Humel, rest assured that all the little ones' professional equipment made it during the move. One cardboard box sustained a soggy corner, rendering it unable to be driven in the "The Imaginary Race" until it dries out. The Other Side of the Mountain sounds great. Especially if it's a more suitable training spot, for Couch Jumping. Do you think The Little Ones will be ready to form a team for the 2016 Olympics?